Nestled in the picturesque Waterberg mountain range approximately 70 minutes from Pretoria lies Modimolle (previously named Nylstroom), a bustling bushveld town. Named after the Sotho for the ‘God(s) have eaten,’ Modimolle and the surrounding Waterberg area boast plentiful free roaming game, birdlife and beautiful indigenous trees and plants. Here, in the heart of Bushveld country on a 64-hectare farm 14 kilometres from Modimolle, lies a little piece of paradise. The 4-star Shangri-La Country Hotel & Spa, hidden in a tranquil tropical setting, reflects the elegant allure of yesteryear. 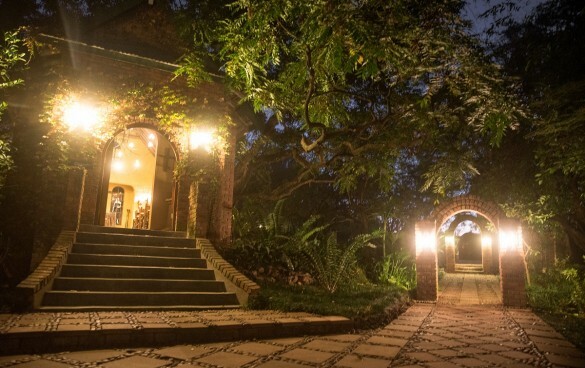 In the open veld bordering this tranquil country hideaway hotel, wild monkeys and baboons play in the trees, while laid-back resident ducks, the beloved Labradors PJ & Fires, as well as tame cats amble around. Offering charming old-world elegance, cheerful staff and a refreshingly uncommercialised atmosphere, this beautiful 28-year old hotel also boasts its very own spa, a romantic wedding chapel, several conference areas, swimming pool and tennis courts. With a TripAdvisor Award of Excellence in 2013, 2014 and 2015 (for consistently high ratings from its travellers) as well as Trip Advisor Traveller’s Choice Award in 2014 and 2015 – the 4-star Shangri-La Country Hotel & Spa has recently undergone extensive refurbishments to its main building. 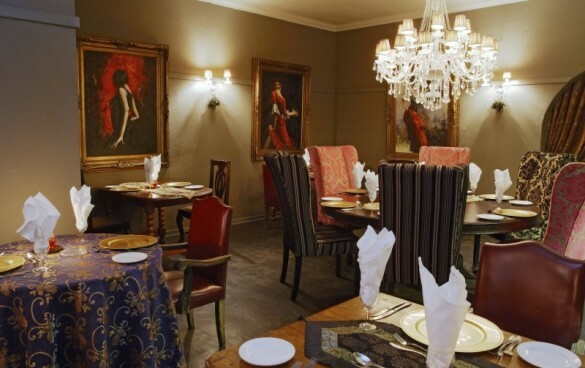 These include an Nguni-inspired promenade, outdoor wooden deck, cellar, airy 200-seater Bellows restaurant, Baroque-themed Heritage restaurant and the cosy Barry’s bar. On the promenade, guests can find a cosy corner to read a magazine or enjoy freshly brewed filter coffee on the wooden deck under its leafy canopy. Exquisite antiques, chandeliers and oversized paintings adorn the lavish Baroque-themed Heritage Restaurant and lounge areas. Located at Shangri-La’s iconic sparkling pool, the new Spa forms part of the relaxation area. Elegant simplicity is what guests can expect from the Spa offering two calm treatment rooms – one customized for couples. The services range from a variety of massages and skin and body care treatments. The beautifully soothing surroundings will ensure a deeply enjoyable experience. The Spa exclusively stocks Africoloy Products. What makes Shangri-La Country Hotel special? When you need to unwind in the restorative surroundings of unspoilt nature with a loved one, friends or family members, Shangri-La Country Hotel offers a delightfully tranquil Bushveld setting with easy access to Pretoria and Johannesburg. Variety of country accommodation to suit different needs. Ideal getaway to laugh, relax and socialise while you savour sumptuous meals, catch up on some reading, go for an early morning stroll or enjoy a game of tennis. Facilities for conference and bush weddings, including a quaint brick-faced chapel. Plenty of open space for outdoor teambuilding activities i.e. soccer, basketball etc. 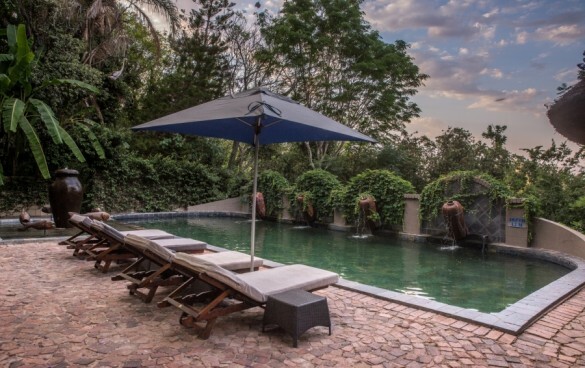 Many guests that visit Shangri-La Country Hotel & Spa claim their own piece of paradise by languishing around the pool, enjoying the well kept gardens, walking in the surrounding bush or simply watching the resident wild monkeys frolicking in the trees. For the more active, a variety of activities is available on site, including tennis, volleyball, jogging trails and bird watching. Shangri-La does not offer self-catering accommodation and bedrooms therefore do not offer guests the facilities to cook their own food. We do not offer mini bar fridges to store food and food may therefore not be brought onto the property. Due to health & safety regulations, we are furthermore not permitted to store any food brought in by guests in our fridges. We are a fully licensed premise and consequently guests are not permitted to bring their own beverages or cooler boxes onto the property. Consumption of such beverages are not permitted in any of our public areas and will be confiscated. We implore guests to abide by these rules as a vehicle search will be conducted on arrival at our gate. Meercats, monkeys and baboons are an integral part of the unique African bush at Shangri-La Country Hotel & Spa. As wild primates instinctively fear humans, we do not feed, tease or engage with the animals that call this place home. As a precautionary measure, we request hotel guests to do the same by keeping a respectful distance from them. They are unlikely to get up to any monkey mischief if guests simply remain alert, supervise children when animals are nearby and keep their hotel windows and doors locked when leaving the rooms. Once guests turn off the road at the Eersbewoon sign and drive along the three-kilometre gravel country road, they experience a gentle sense of peace as the burden of urban stress lifts off their shoulders. A welcoming avenue of Jacaranda trees line the driveway entrance to Shangri-La. A profusion of verdant tropical plants – replenished by on-site borehole water – surround you as you stroll on the sloping walkway with its tinkling waterfall up to the main complex. Inside, gracious antique pieces blend with interesting knick-knacks, old ornaments and large framed paintings to create a welcoming ambience reminiscent of Colonial Africa. Shangri-La Country Hotel & Spa boasts a pleasing variety of accommodation – from standard rooms and thatched rondavels, to spacious family rooms and executive rooms. These hotel rooms or thatched rondavels have twin or double beds with crisp white Percale linen and elegant mahogany furnishings. The rooms also feature a bathroom with bath or shower, TV with select DSTV channels, air-conditioning and coffee making facilities. Shangri-La’s family units offer a king/double bed with white Percale linen in main room and a single bed in the inter-leading room. The spacious units have their own bathroom with bath or shower, air-conditioning, TV with select DSTV channels and coffee making facilities. 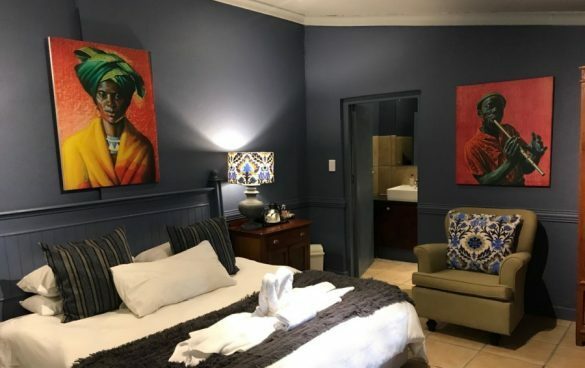 Situated between the lush vegetation, these tastefully decorated country-style units feature a room with double/king bed, white Percale linen and bathroom with bath/shower. Each air-conditioned executive room has a TV with select DSTV channels, air-conditioning and coffee making facilities. Located on Eersbewoon Road, between Bela Bela & Modimolle, Limpopo Province. From Gauteng: Follow the N1 north towards Polokwane (Pietersburg). Take the Modimolle (Nylstroom) off ramp at the Kranskop Tollgate, turn left at the stop sign and follow the road towards Modimolle (Nylstroom). Turn left at the Eersbewoon sign and continue for approximately 3.3km until you find our gate on your right. Turn right here and continue on the gravel road for 2.6km until you reach the Shangri-La Country Hotel & Spa. From Polokwane: Follow the N1 south towards Pretoria, pass Mokopane (Potgietersrus), Mookgophong (Naboomspruit) and take the Modimolle (Nylstroom) off ramp (R101). Continue on this road until you reach the first 4-way traffic light intersection. Turn left into Nelson Mandela Drive and continue until you have left the CBD. Travel on for approximately 5km until you find the Eersbewoon turn off sign. Turn right at the Eersbewoon turn off sign and continue for approximately 3.3km until you find our gate on your right. Turn right here and continue on the gravel road for 2.6km until you reach the Shangri-La Country Hotel & Spa. Guests can choose from a diverse range of activities in Modimolle, Bela Bela (formerly Warmbaths) and the surrounding areas of the Waterberg. Most of the following attractions and activities are all within a 20-minute drive radius, while other day outing venues are between 30-40 minutes drive away. The Hydro (at Forever Resorts in Bela Bela) is famous for its therapeutic hot mineral springs. Here guests can relax with specialised beauty treatments including full body massages, pedicures, manicures and hydrotherapy. Tee off for a game of golf at Koro Creek Golf Estate or visit one of the acclaimed signature golf courses designed by Ernie Els and Gary Player. Get tactical. Skulls Paintball, situated on the R101 five kilometres from Bela Bela, offers a fun physical activity that demands teamwork and strategy planning. Let us pack you a picnic basket to visit Doorndraai Dam Nature Reserve at the foot of the scenic Waterberg Mountains approximately 90 minutes drive away. Visit the historical summit of Buyskop, situated approximately four kilometres north of Bela Bela. During the Republican days, the site provided fresh horses to travellers and acted as a halfway house for the mail coach that drove between Pretoria and Polokwane (formerly Pietersburg). Shangri-La offers a variety of options for guests that enjoy delicious cuisine and fine beverages. Outside guests are also welcome to enjoy meals at Shangri-La, provided they make a booking beforehand. Traditional South African breakfasts, breakfast buffets and lunches are served in the Bellows Restaurant that can seat up to 100 guests. The cosy Barry’s Bar is ideal for socialising over cocktails, cognac, champagne or one of South Africa’s finest wines available at the hotel. The intimate Baroque-themed Heritage Restaurant serves lunch and sumptuous à la carte dinners. Light lunches are available on the wooden deck for guests who want to dine outdoors among the treetops. The quaint open-air Chimes Square patio serves decadent afternoon High Tea for both hotel residents and outside guests. Bookings are essential. The Bellows Restaurant, named after its signature bellows table at the big fireplace, is the ideal venue for large gatherings of up to 100 guests. Here guests can enjoy a hearty traditional South African breakfast featuring both hot and cold breakfast. The spacious sun-filled venue has sliding doors that open to the outside. Guests can also enjoy light lunches outdoors on the large wooden sundeck, or on the Chimes Square patio that both lead off from the restaurant. Opposite a small lounge, area – boasting a huge leather couch, comfy chairs and antique table – is an intimate, glass-enclosed eating space. With its unique fireplace, exquisite antique tables and chairs and dramatic oversized paintings, the lavish Baroque-themed Heritage restaurant offers delectable a la carte dinners and lunches. Featuring an extensive wine list, the Heritage can seat up to 40 guests, making it a charming space for a small function or party. Barry’s Bar, named after the late Mr Barry McGeary (one of Shangri-La’s co-founders), is a cosy nook amid antique furniture and paintings to enjoy a martini, cognac or glass of select wine. Barry’s Bar is situated opposite the Heritage Restaurant. Spoil yourself by selecting one of the fine wines from Shangri-La’s own cellar. A specially created wine list offers a variety of sparkling, red, white and dessert wines. The renowned Waterberg Country Hotel, Shangri-La, has crossed the threshold into the international hospitality arena. 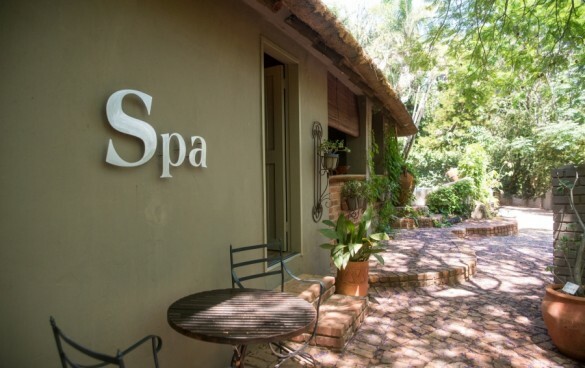 In response to the high demand from its loyal patronage of the past 2 decades, the romantic Country Hotel in the heart of the bushveld opened its very own Spa in 2014! The long awaited move elevates Shangri-La to new heights of decadence and service in an atmosphere of pure relaxation and sensual enjoyment. Located at Shangri-La’s iconic sparkling pool, the Spa forms part of the relaxation area. “We created a whole new space for our guests to enjoy the comforts of our well known destination,” says South of Africa MD Stef Venter, who in 2013 also opened a similar concept at the 5-star Abalone House & Spa in Paternoster. Elegant simplicity is what guests can expect from the Spa, which opened its doors on 1 July 2014 at Shangri-La. The Spa offers two calm treatment rooms – one customized for couples. In 2017 the spa received a facelift, and in October 2018 introduced the Africology brand to its services, which range from aromatherapy full body massages to hot stone massages. The beautifully soothing surroundings will ensure a deeply enjoyable experience. An enticing menu of Africology products are also available to guests which further expands on the treatments offered on site. Please take note that although every effort will be made to accommodate last minute bookings, advanced reservations are essential to secure your treatment. Enquire about our various treatments by calling 014 718 1600. Download our SPA BROCHURE here. Shangri-La Hotel offers a peaceful country venue for conferences, business indabas, teambuilding events and workshops. Conference organisers can opt for day conference- and overnight packages. Offering four charming conference venues, it’s an ideal place to foster creative and productive events. Conference facilities include flip chart, projector hire and sound system hire. Our helpful staff will happily arrange teambuilding sessions that feature group volleyball contests, potjiekos competitions, treasure hunts and more. Our Labyrinth (the result of a life long relationship with Dr Bruce Copley, Holistic leader of AAHA Learning) is the perfect option for alternate teambuilding exercises. Another recent addition include The Pavilion with its rose garden that is ideal for outdoor events, with further outdoor conference venues in development. 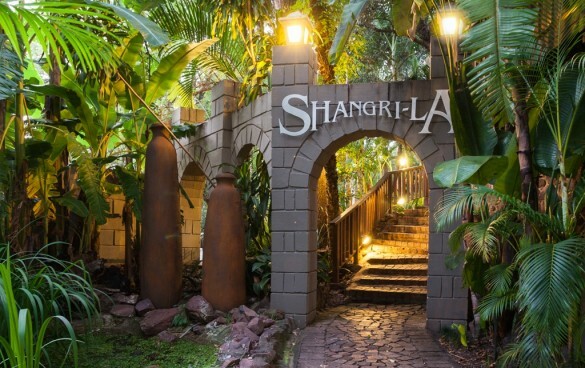 Shangri-La’s theme evenings – encompassing creative Chinese, Mauritian, Out-of-Africa and traditional barbeque menus – are especially popular among conference delegates and Year End Functions. This impressive 240sq metre hall boasts a large veranda, wooden floors, imposing chandeliers, luxurious bathrooms and high quality sound equipment. With its wooden stacking doors, the centre can be utilised as one large venue or divided into two smaller conference rooms. This thatch-roofed conference venue with its rustic wooden beams, colourful paintings and outer wooden doors opens onto a landscaped Bushveld garden. Doors on the opposite side conveniently open onto the roofed Kraal area where delegates can enjoy lunches and tea breaks. Indaba seats 80 delegates. Situated next to the Indaba room, the cosy thatched Kgotla room also leads out onto the Kraal area. 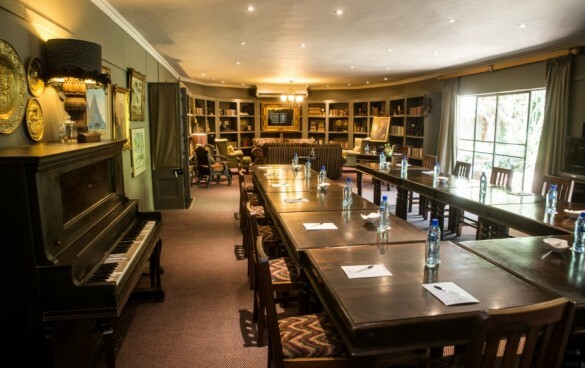 This intimate venue is perfect for smaller workshops, seminars or conference dining and is the ideal breakaway room. Adjoining the main building complex is the Boardroom, a small welcoming venue with beautiful antique furniture that leads out onto the patio and swimming pool area. The patio is ideal for tea breaks while the pool terrace provides a relaxing space for lunches. The boardroom seats 90 delegates. The aptly named “Glas Huis” (translated meaning Glass House) is a stunning new venue, boasting glass walls on all sides. The “Glas Huis”, which opened in October 2018, caters for private functions, small conferences and wedding receptions. This intimate space, which can accommodate 40 guests during a standing cocktail event, offers 360 degree views of the surrounding gardens, with a duck pond on the one side, while the attached outdoor boma provides a welcome outside space for guests to socialize around the flames of the fire pit. Located adjacent to the Madala & Magogo venue, and a short walk from the on site chapel, the “Glas Huis” is also perfect for pre-wedding cocktails where guests can gather and enjoy the rustic and eclectic decor that makes up this space. An indoor jet master fireplace will also help keep the venue warm during the winter months. What makes Shangri-La special for conferences? Plenty of outdoor areas to host teambuilding exercises, lunches and teas. Conveniently located within an hour’s drive from Pretoria.